Senior Minister Ly Thuch yesterday accused some powerful countries of using human rights as a tool to impose their values on lesser developed nations. Mr Thuch raised the issues at a workshop on Supporting the Least Developed Countries in Asia and the Pacific, attended by participants from less developed countries including Afghanistan, Bangladesh, Bhutan, Kiribati, Laos, Myanmar, Nepal, the Solomon Islands, Timor-Leste, Tuvalu and Vanuatu. 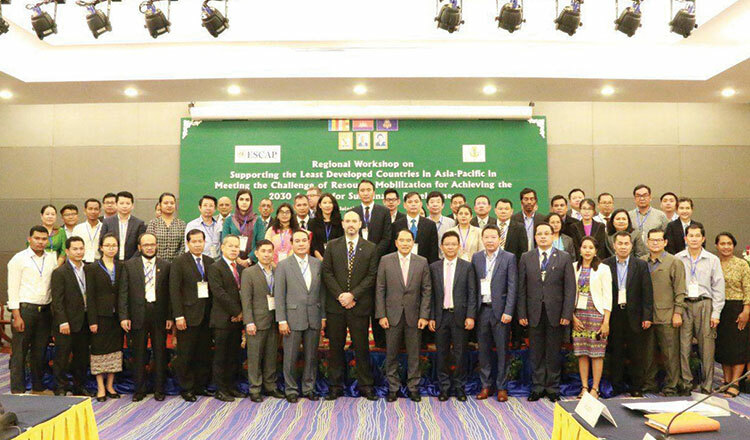 The workshop is co-organised by the National Committee for The Economic and Social Commission for Asia and the Pacific (ESCAP) and United Nations-ESCAP. Mr Thuch, who is National Committee of ESCAP president, said that Cambodia cannot trade its sovereignty and peace for assistance. He said that the Kingdom has achieved full peace, territorial integrity, and political stability along with the firm observance of the principle of the rule of law and democracy. “History has proven that it is not easy to achieve and maintain peace and stability,” he said, adding that each country should provide proper respect for the UN Charter by avoiding interference with, damaging, or disrupting sovereignty of an independent state. He noted that the imposition of unilateral sanctions has become a popular weapon of powerful nations in managing their international policies, which is completely driven by geopolitical agendas. In his remarks at the 73rd United Nations General Assembly in New York in September, Prime Minister Hun Sen accused superpower countries of using human rights to impose their will upon other countries, including Cambodia, and meddle with their internal affairs to push forward their own agendas.